Lexus has been known since years as a brand redefining luxury and sport altogether. 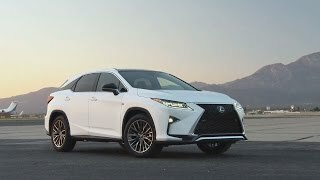 With its very new released Lexus RX 350 F Sport 2016 the company has kept the flag high inside the hearts of car lovers. Model comes with the all new Lexus Safety System + offering leverages with latest accident precaution and safety technology. Let us check what more apart from this the new RX 350 F Sport brought with it at the 2015 New York Auto Show. The interior of Lexus RX 350 F Sport 2016 is a serene example of elegance molded in a car’s cabin. The model with it brings a treat in form of Yamaha laser-cut ornamentation for those in particular who gracefully accepts additional dimension in the cabin’s refinement. Above the center stack is placed a wide 12.3 inch monitor with full screen map while the model also brings a HUD display portraying vital vehicle information for driver. Though a minute step but with a appreciable reason, Lexus has placed the shift lever little away from instrument panel so as to avail more of operating space for driver. At the rear of the Lexus RX 350 F Sport more space have been provided to comfortably give rest to the passengers with long legs, assuring a comfortable ride. Last but not the least is the 11.6 inches dual screens to take care of the entertainment for passengers seating at the back seat. 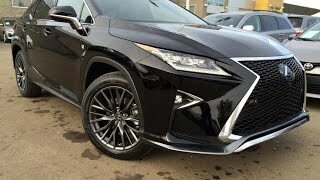 The exterior of Lexus RX 350 F Sport 2016 gets a bold and aggressive look with the sheet metal works. The flowing roofline reduces the wind noise, blacked out C-Pillars and the massive grille makes it more eye gleaming. The model brings with it the all new 20 inch aluminum wheels with larger tires as compared to predecessors. The addition in turn improves the vehicle stance and come with an option to match them with body-color. The rear of RX 350 F Sport gets an all new sharper look. The LED L-shaped tail lights create a wider presence leaving a illuminated presence. To blend these with a more impressive touch the dual exhaust pipes are integrated, giving an impeccable premium appearance. 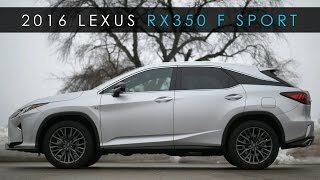 The Lexus RX 350 F Sport 2016 comes with an upgraded version of 3.5 liter V6 engine producing 300 hp of power and is mated to eight speed automatic transmission. The RX 350 F Sport has a fully independent suspension system and a double wishbone setup at rear giving a smoother ride. 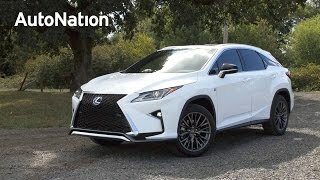 The model also comes with Adaptive variable Suspension which monitors and assures better handling and smoother ride depending upon the boulevard driver is taking the Lexus RX 350 F Sport. In Context to pre-mentioned Lexus Safety System+, buyers get a Pre Collision system to detect sudden stops and to execute automatic braking system if the circumstances need it. Other features are lane Departure Alert, Lane Keep Assist, Panoramic View Monitor and rear cross traffic alert.